Empowering Enterprise Wide Cost Reduction Managing Employees, not devices - CFO’s and CIO’s do you know the following: 1) Actual cost per page? 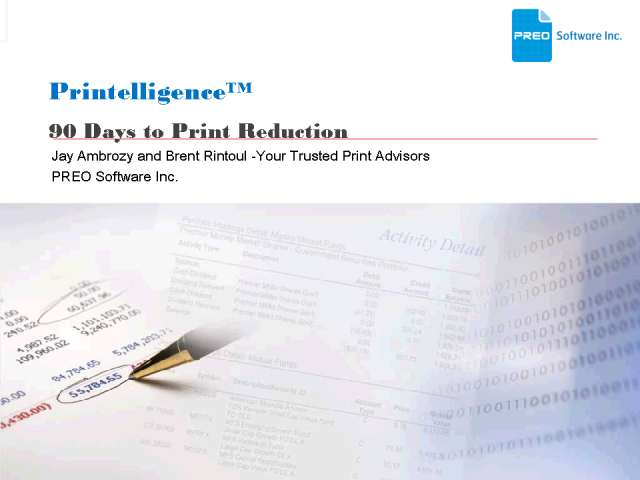 2) How much toner per impression per page? 3) Maximizing toner kits…do I get what I pay for? 4) How do I remind employees to not print in color? Every time? 5) How many one page documents do your knowledge workers really need to print? 6) Are desktop local printers being hid underneath desks? 7) Who is paying for the toner? 8) What is Toner yield between a network printer and a local print device? 9) Did we purchase over capacity again in our device fleet? 10) Where should I repurpose my devices now that we have reduced our workforce? 11) How can I manage document workflow in each business unit? 12) Am I overpaying on a per page basis? 13) Why are we printing more than before?